I mentioned many times that for one who follows karma yoga well his mind gets purified on account of that and he gets the eligibility to tread the jnAna path; and that, if such a karma-yogi gets that mental purity and starts jnAna-yoga, either in this birth or in one or two more births, he will obtain his advaita mukti in that very life. How does this reconcile with the present statement that karma-yoga is nothing but one of the many upAsanAs, and that instead of going to the path of jnAnayoga he will go to Brahma-loka and then he will get advaita-mukti only after several crores of years when the Grand Dissolution happens? It all depends on what he has been aiming at, what he has been keeping as his goal. 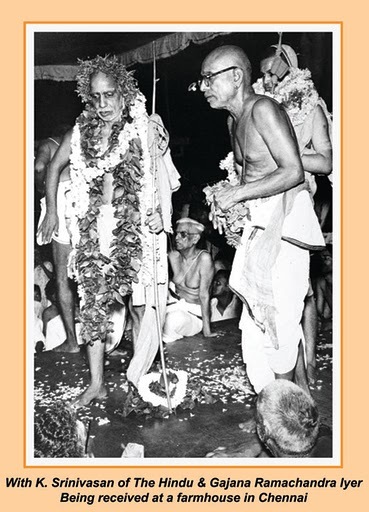 If he had had the goal as advaita, and if however he started karmayoga-type of life just to get the mental purity and eligibility for jnAna yoga, then that itself would lead him to the path of jnAna, as soon as his mind is purified; and he will also soon reach the destination of advaita mukti .